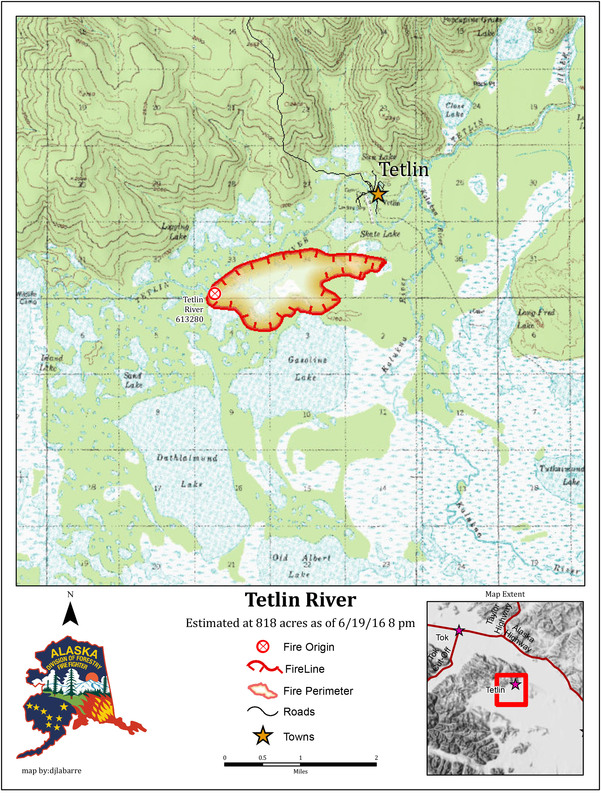 June 22, 2016 – Due to more accurate mapping, the Tetlin River Fire south of Tok is actually about 200 acres smaller than previously estimated. A mapping mission on Tuesday showed that the fire is actually 818 acres instead of the approximately 1,000-acre figure that was being used, according to the Alaska Division of Forestry. On Wednesday, crews continued mopping up hotspots and putting in containment lines around the fire perimeter. Firefighters are mopping up deeper into the interior of the fire and working toward the objective of mopping up 300 feet inside the perimeter. Crews are also cutting down hazard trees that pose a risk to firefighters and villagers traveling by boat on the Tetlin River. Nearly 300 personnel, including 10 Alaska hand crews, are still working on the fire, which burned less than a mile from the village located 16 miles off the Alaska Highway just south of Tok. The fire received light showers early Wednesday morning but the precipitation was not measurable and had little effect on the fire. The forecast is calling for continued hot, dry, windy weather with a chance of thunderstorms in the eastern Interior, which is making mop-up operations challenging. All crews are camped out along the fire perimeter to increase efficiency and reduce travel time and risk associated with flying or boating out to the fire each day from the staging area in the village of Tetlin. Helicopters and boats are being used to transport food and equipment to crews that are camped out. Alaska firefighters are familiar with camping out on the fire line and the complexities that go with it, such as cooking their food over a campfire and leaving no trace. The Tetlin River Fire started on Friday, June 17 and quickly advanced on the village driven by south winds. The fire is believed to be human caused and is under investigation. A community meeting was held in the village on Monday and another meeting is scheduled for 7 p.m. on Thursday in the Tetlin Tribal Hall. A temporary flight restriction has been put in place for the Tetlin River Fire to allow aircraft working on the fire to operate safely. The TFR covers a 5-mile radius around the fire and pilots should check the status of the TFR before flying in the area. For more information on the fire, call (907) 356-5511.